Yeah, I know what you’re thinking: yet another article about Sweden reaching unimaginable cuckness levels. But it’s their fault, as every news that comes from Sweden nowadays is increasingly more shocking than the previous; it’s like they’re trying to do their best in raising the bar of insanity to absurd heights. This time, Sweden’s Lutheran church decided to go full retard, as in gender neutral; from now on, they’ll not call God ‘he’ anymore. Yes, I know, it sounds completely insane, and it is. But that’s what multiculturalism and social justice can do to a former nice country. And it’s now official, as the Evangelical Lutheran Church in Sweden already instructed the clergy to only refer to God as, well, God, and to avoid Son and Father, because, you know, they’re not gender neutral and they may offend transgenders, women or whomever. 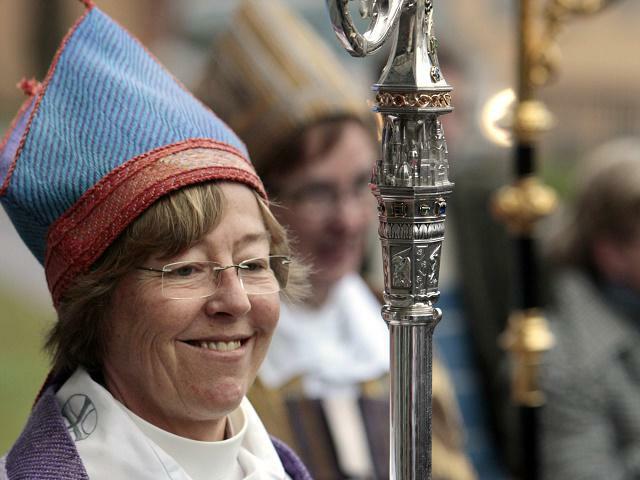 The Evangelical Lutheran Church in Sweden, also known as the Church of Sweden is ruled by a woman (imagine my shock), Archbishop Antje Jackelen respectively, which is, take a load of this: World’s First Lesbian Bishop (among other things, she asked churches to remove crosses and to install Muslim prayer space) elected 4 years ago on a, well, very progressive platform. The new decision to use gender neutral pronouns for God will come into effect on May 20th next year, on the day of Pentecost. According to Archbishop Antje Jackelen, the Church of Sweden had flirted with the idea of using ‘inclusive language’ (gender neutral pronouns for God) since 1986, but back then, the country wasn’t quite ready to commit cultural suicide, so the cultural Marxists in Sweden had to wait for 3 decades, but now their work is complete. As Archbishop Antje Jackelen subtly put it: “Theologically, for instance, we know that God is beyond our gender determinations, God is not human”. or our LGBTQ or our anything else. The god of Jesus is MALE! Truth be told, it won’t matter what pronoun they use if they keep letting in Muslims at the current rate. Sharia doesn’t tolerate gender neutral references anyway. “You cannot replace 2,000 years of theology; undermining the doctrine of the Trinity and the community with the other Christian churches it really isn’t smart if the Church of Sweden becomes known as a church that does not respect the common theology heritage”. Well, here’s where you’re wrong kiddo. They just did it. The Church of Sweden used to be the state church of the country until the year 2000 and has over six million members. By the way, Sweden’s population is 10 million, give or take. Forty five percent of the priesthood is composed of women and they also make for the majority of the students in the Church of Sweden’s seminars. The Left universally fights imaginary battles while ignoring the real ones. Their country is in serious decline and the Swedes focus on things like this. The Left does the same thing in this country. You would think that gays and transgenders made up the vast majority of our population based on the degree of news we are subjected to every day on these subjects by the MSM. Sweden is run by feminazi lesbians. Just look at the picture above. Seems like there are no men in charge over there any more. They hate men.